We rate, We predict, You win. Footballian is an online platform offering comprehensive football information that improve your chance of winning in football betting. We are expertise in measuring the strength, form and performance of football teams, like a football version of Timeform. Who are the intended users of Footballian app? All iPhone, iPod Touch and iPad users who like football or bet on football. No matter you are a football fan of any team, football player, working in football industry, causal or professional punter, we are happy serve you. What are the differences between Footballian and other tipster services? We offer much more than tips. Footballian helps you to pick the best bets and improve your chance of winning. If you bet with someone's tips, you will always rely on someone else. To win in long term, we need to analyse football matches effectively and bet with values. That requires in-depth of knowledge in football and lots of time studying the information. The good news is, we have done most of the work for you. We digests and translates the important information into numbers and symbols for you to compare easily. With Footballian, your bet picking process has never been easier and so rewarding. TeamFORM ratings represent "the strength and form of football teams in Europe expressed in goals", using a scale of 10 rating points for 1 goal. If two teams with 10 rating points difference play against each other, the team with higher rating is expected to win by 1 goal on average. Our rating system is derived by careful examination of 20+ years of football match results, including 100,000+ matches of domestic leagues and European cups, with various factors taken in to account such as the strength of opponents, timing of each goal, home advantage and football standard between the European countries. How do you rate football teams and predict the results? We rate football teams based on their past performances and we predict match results based on several factors including the ratings and home advantages of both team. 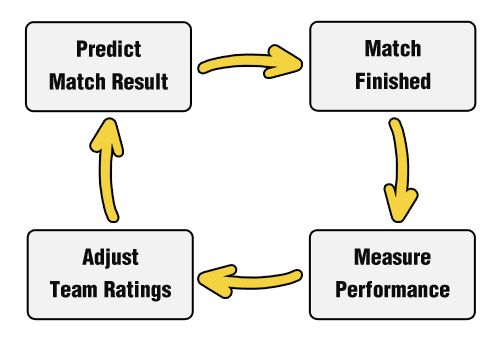 The following is the cycle of how Footballian rate and predict match after match. As the processes repeat for every league match, the system becomes more accurate eventually and a better reflection of team strength. Why do you only provide the odds from bet365? It is always not a bad idea to search around for the best odds and we are currently working on providing odds from more bookmakers. But if you want to bet with one single reliable bookmaker offering competitive odds, bet365 is a decent choice. Bet365 is the best all-rounded sports bookmakers in terms of reliability, choices of betting markets, odds values, user friendliness and other features such as video streaming and consistent free bets offers for loyal customers.